My two cousins (their names are Florence Cruise and Carol Nelson) found this in their dad's "sea chest" when they were going through the house. This was passed down from my great grandfather who was one of those on the scene to rescue and perform services. 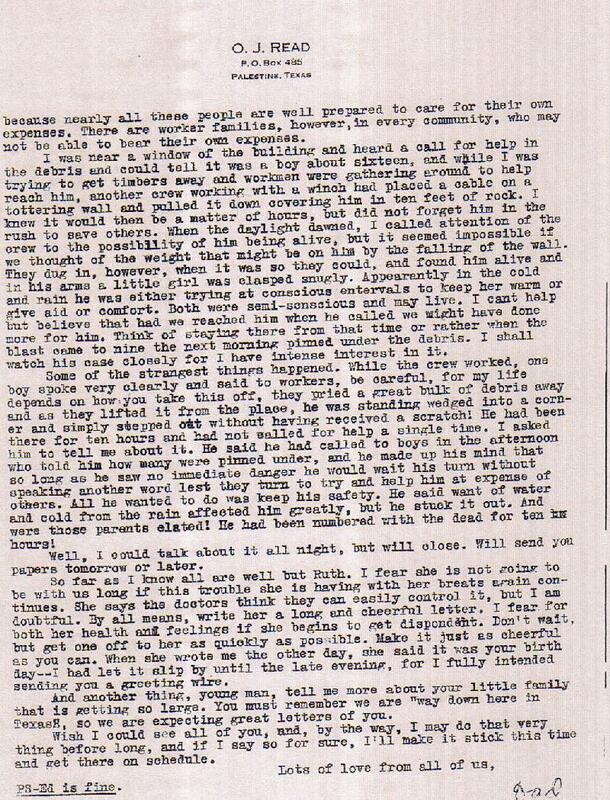 My great grandfather wrote this to their dad (his son). Written by O.J. Read to Bill Read. 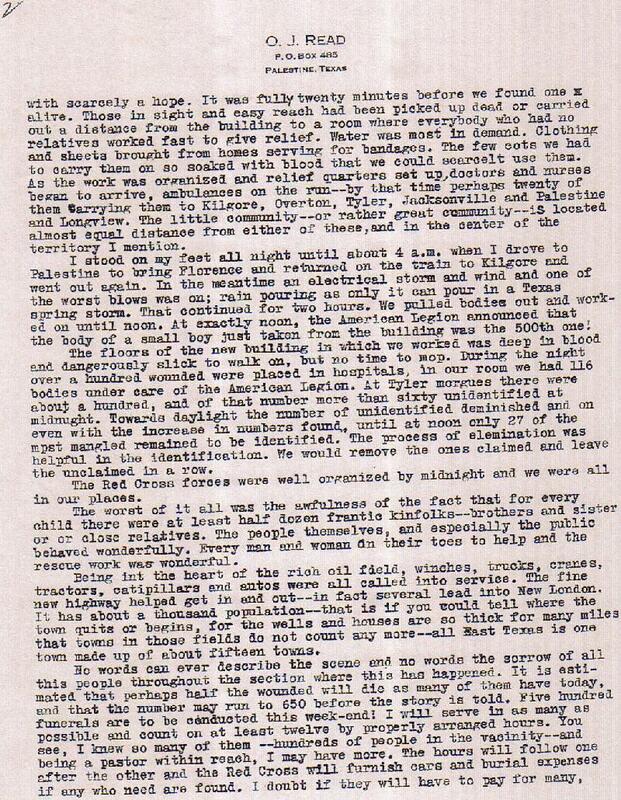 I am attaching a transcript of my father's account of the New London School explosion. My father 84 and is living in Groveton, Texas. Mary Etta and I, we married in February and we moved to a place there called the Hale Farm. It had one well and a three-room house. We didn’t have a car and hadn’t been there very long, and we didn’t know anything about the surrounding country. I was sitting there one day reading a magazine, and I heard an explosion. It scared me, and I jumped up and run to the back door. There two 500 barrel tanks behind our house there, and I thought one of them had blown up, but it hadn’t. I run back, and up in the air was a lot of dust. This dust was coming from an explosion at the school. It was over behind some pine trees, about ¾ of a mile, and I didn’t know there was even a school there. It was one of the richest schools in that part of the country, because they had oil land of their own. 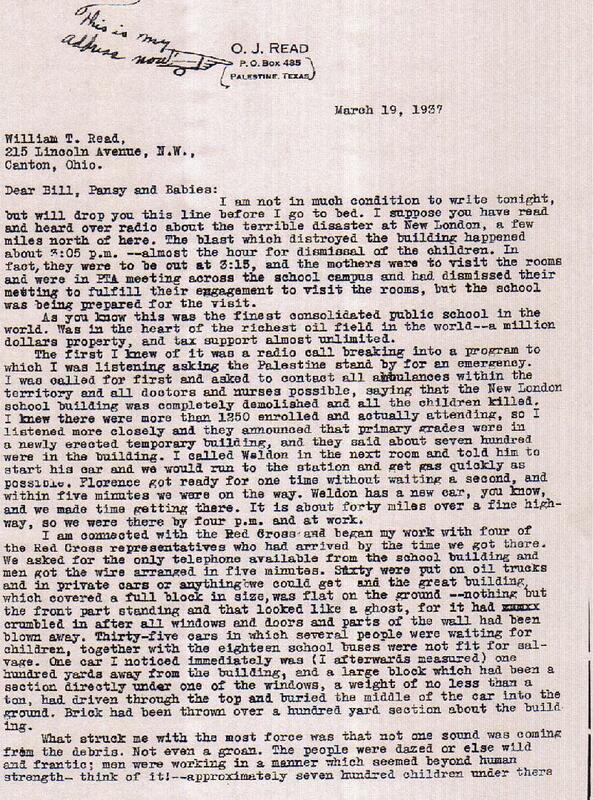 This school had blown up because it was made with hollow bricks, and the Superintendent and the janitor cut off the Lone Star Gas Company’s gas and hooked onto a line they called a "drift line." This just went through the field picking up old gas and flaring it up at the Parade Refinery. They left a leak in a union where it went through the wall, and several days the kids had been talking about having headaches. They complained about it and nobody paid much attention to it. What happened was, a kid down in the basement - it wasn’t his fault - he plugged in a sander and caused a spark. That entire school blew up. We stood around there a little bit, Mary and I did, and in a little bit we saw a kid come running up the road and we went out there and asked him, "What happened?" He said, "The school blew up." Well, about that time - we lived on the road from Henderson to New London. There were fire trucks, ambulances, cars - every kind of vehicle - emergency vehicle - come by there at high speed. So we decided we’d walk up there, and we went up there it was a pretty bad mess. There was over 300 teachers and kids killed. I saw them pick up a roof there that - they picked this roof up that had fell down on over 20 kids and a teacher and killed them. The Arp ambulance was a brand-new ambulance, and the school ground was terraced. The ambulance backed down in there and loaded a bunch of kids in there to take them to the hospital. When it went over that terrace, I saw blood run out the end of that thing. It was pretty bad. That was - everybody knew, of course, in a little while, and there was all kinds of things went on. Humble Oil Company, the biggest oil company around there, they sent a man down there and told him, said, "Anybody that needs a funeral paid for, you pay for it." Gave him authority to pay for it from the Humble Oil Company. They came down there and they buried a lot of kids, and there was a lot of things went on. A lot of kids they didn’t find for a day or two. There were some kids picked up the body and carried plumb to Jacksonville. Every funeral home around there was picking up bodies and taking them. Of course, they were in it for the money - it was a sad thing. They buried one casket that had five body parts in it that they couldn’t identify. It was a pretty said thing. It tore up the whole community. There was a fellow come down there - there was a spring close to the house Mary and I lived in. Real good water. People would come down there and get water. There was a guy come down there. He had two daughters in that explosion and one of them was killed outright. The other one came home. She didn’t look like she was hurt, but she just walked about two days kind of in a daze, and one day she just fell dead. Never did really know. The superintendent that hooked up this gas line, he lost a daughter in that. So it was a pretty sad thing altogether. One little-known fact is that Adolph Hitler sent flowers over there to the funeral to some kids. I don’t know which ones or anything like that, but he sent flowers over there. At that particular time, in 1936, he wasn’t known to be that mean. 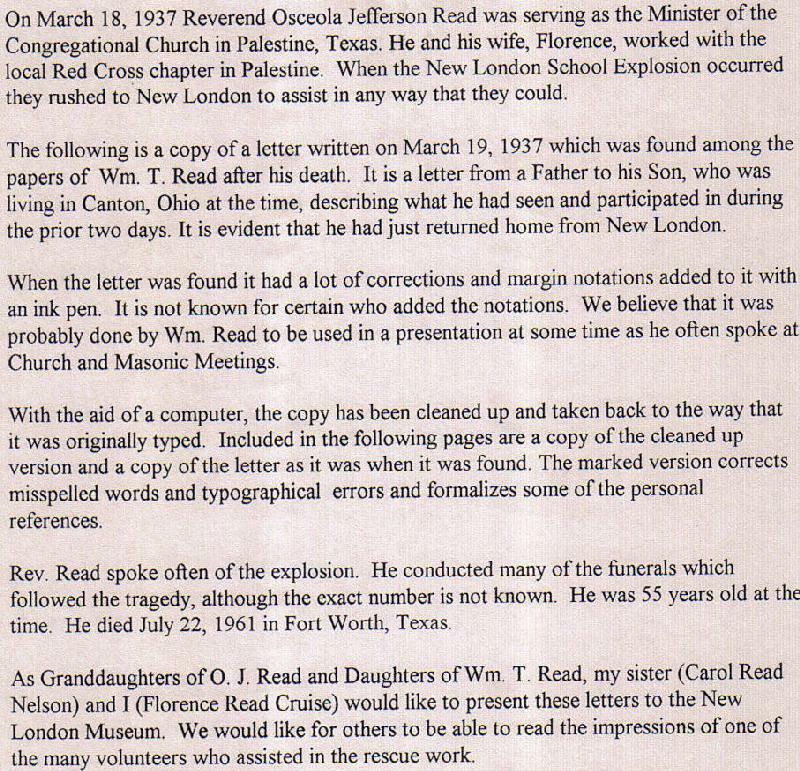 Today, I happened to run across your request for information from people who knew something about the New London School Explosion. My sister Elsie and I were both in the explosion. I was in the 3rd grade and my sister was in the 5th grade. As you may know, there was a PTA meeting being held in the school auditorium that afternoon and since the elementary school students had gotten out early, I walked over to the school where my sister's classroom was - located in the basement of the school. The bell had just rang to let the children out - everyone was gathering in their books - and then the school exploded. All children in the next room to us were killed since the wall fell in on them. My sister never lost consciousness but I was completely covered by debris except for my hands. She proceeded to dig me out and stayed with me until someone picked me up and put me into a truck going to the Overton Hospital at which time we were separated. When she later came to the hospital, she searched for me and found me laying on a sheet in the corner of a hospital room unconscious and with head injuries. At that time, the hospital staff was taking pulses and removing bodies and she feared they would take me away. She had a nurse that knew our family to put a tag on me so I would not be taken and because she was ambulatory, she wandered all around with her right eyelid cut in two - but because she was not as badly hurt, the staff tried to take care of the more seriously wounded. My mother made it to the hospital and was just overcome by the carnage that she observed. My father, who worked in the oilfields, found her on the hospital steps and together they located me and the staff loaded me into an ambulance and sped me to Tyler where a neurosurgeon was on the way in to help with the injured. I was taken to Bryant's Clinic in Tyler, where I became the first patient of Dr. DiErrico (from Dallas) who removed the bone from my upper forehead and said "if she lives 24 hours, she will make it". In the rush to get me treatment, my sister Elsie was left in Overton. By the time they got her to Tyler, they had to put her in the Mother Frances Hospital. She did not believe that I had survived. After her eye was sewn up and I had regained conscious, they brought her to visit me and we both were reassured that we had indeed survived. I had no recollection of anything until I woke up in the hospital. 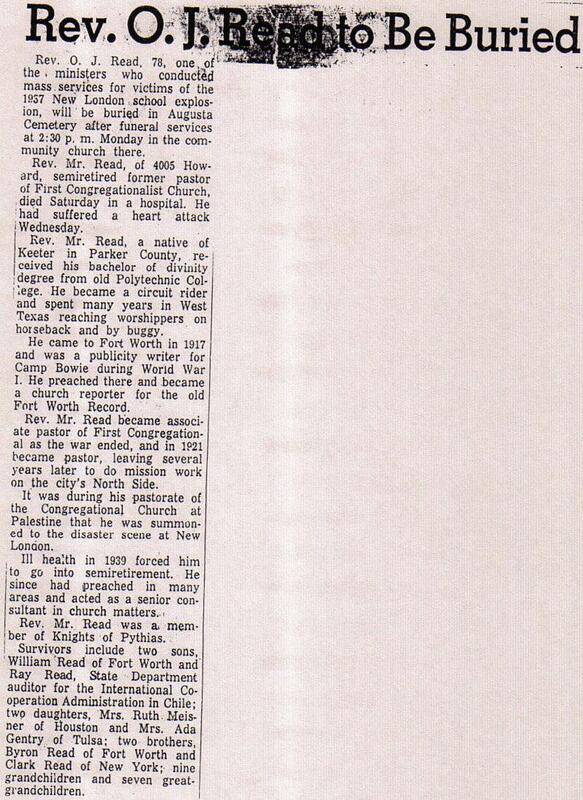 My family moved in 1938 first to Hobbs, N.M. and then to the Houston Heights, where the family lived for many years. 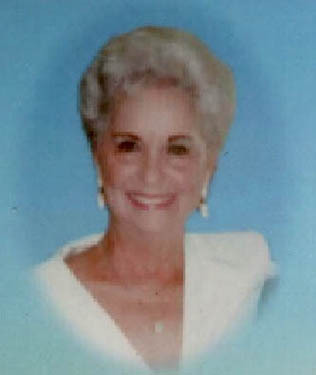 My sister Elsie died in 1998 of leukemia. We had three cousins who attended New London at the same time. 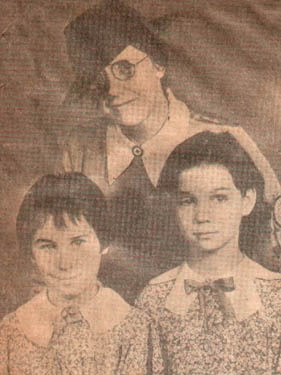 Their names were Mildred, Sybil and Billie Jordan. My parents were Wilson and Corine Jordan. Because my grandfather's name was James and my parents had only daughters, I was named Jimmie (after my grandfather). Elsie and I never went to the reunions of the survivors but did make a trip in about 1990 to the site of the memorial in New London. Center: Jimmie and Elsie Jordan with Miss Thora Ingebritson (Assistant to the Director of Nursing Service of the Midwestern Red Cross). taken during a trip to Dallas to assess injuries by doctors. Six months after the explosion. 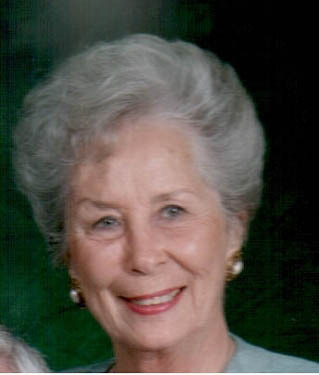 Right: Elsie Jordan Hendricks, Deceased September 1998.